German online-portal wegweiser-freiwilligenarbeit.com and South African NGO CACH (Campaign Against Canned Hunting) alert people that want to contribute to the conservation of endangered species in Southern Africa not to participate in lion breeding projects. Animal farms that advertise caring for supposedly orphaned big cat cubs are frequently part of the hunting industry. 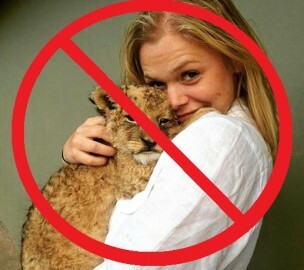 That is why wegweiser-freiwilligenarbeit.com, as the first volunteering directory in German speaking Europe, bans all lion cub activities from its project database. The offering of such projects will also play a bigger part in its selection process of volunteering organisations that can showcase their projects in the directory. Frank Seidel, founder of wegweiser-freiwilligenarbeit.com, shares this opinion. “Our aim is to promote responsible volunteering abroad. Projects where the volunteers’ good intentions are used by business owners to their own advantage don’t have their place in our directory”, says Seidel. The breeding projects with lions, leopards or cheetahs are the second kind of volunteering projects that are banned from the portal, after orphanage volunteering projects. Breeders of big cats lure volunteers into their parks with false promises, especially in South Africa, but also in other African countries. The possibility to take care of lion cubs and other big cat cubs is the owners’ most important argument when advertising their parks. The breeding is supposed to diversify the gene pool, they argue. Later, they pretend to release the lions into the wild, where the animals can mate. This, however, is not at all the case, criticizes CACH. Lions accustomed to human contact from an early age are not fit to survive in the wild and, furthermore, would be a threat for the local population. There exist no projects that release lions back into the wild. The animals are bred to be killed in cruel canned hunts. This kind of hunting is getting more and more popular in Southern Africa. In a canned hunt, hunters pay about 12.000 Euros to kill the king of the jungle in a confined area, with the lion not having any chance to escape. During the five or six years until the lion is sold for canned hunting, the breeder makes a total of about 60.000 Euros, estimates CACH. The volunteering fees make up for only about 20 percent of the breeder’s income. Other sources of income, on top of the canned hunting bounty, include walks with young lions, selfie photo shoots with the big cat cubs or selling the bones of the dead animals to Asia for traditional medicine. Luckily, throughout the whole African continent there are also many good volunteer conservation projects that allow volunteers to contribute to the sustainable protection of endangered species. Many national parks and private reserves offer volunteers to observe the big cats in the wild instead of cuddling with them inside a cage. Moreover, there are projects where injured animals or animals saved from captivity can live and end their lives in good conditions. wegweiser-freiwilligenarbeit.com (guide-volunteering.com in English) is the online portal for flexible and responsible volunteering abroad in German language (targeting Germany, Austria and Switzerland). At the heart of the portal is an online marketplace with a comprehensive database of volunteering projects. The database is open to international volunteering organisations that can publish their offers in English. The founder of wegweiser-freiwilligenarbeit.com is Frank Seidel, international volunteering expert with more than 20 years of experience. Frank Seidel is the author of a German guide book on eco-volunteering, and was the marketing director of one of the biggest international volunteering organisations until 2012. CACH is a non-profit organisation registered in South Africa that fights the lion breeding industry in South Africa. CACH’s focus are especially the petting farms that are very attractive for tourists and volunteers and that allow lion breeders to externalize the costs for raising the lion cubs. The travel industry finds itself in a unique position to change the tourists’ behaviour. It can help to use the tourists’ money to exert pressure on the hunting industry by supporting only ethical projects. That is the only way to cut the money supply and to exclude the hunting industry from the earnings generated by tourism. In 2015, CACH has been nominated for the World Responsible Tourism Awards.